As people keep on updating, there are millions unused mobile phones which can be recycled, but before you recycle be sure you do everything possible to remove any of your personal data. When you turn your phone in for recycling those phones beyond repair are recycled in line with environmental best practices. Cell phone parts are turned into saucepans, batteries or irons. (nickel); Copper from circuit boards can be used for plumbing and plastic can be granulated and converted into traffic cones. Used cell phones that are in working order are refurbished and exported to places such as Hong Kong, China or to Eastern Europe. Thousands of unused cellphones in New Zealand have been shipped to the other side of the world usually to Third World countries - often countries that are home to companies that thrive on spam and Internet phising programs. 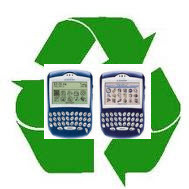 While this is a great practice and everybody should recycle their phone, it may come as a surprise to most BlackBerry users that the BlackBerry has a log file where it keeps a detailed record of every single action that you perform on the device including your incoming and outgoing phone calls. To view this log file of your BlackBerry, go to the home screen, hold the ALT key and press LGLG. If you are using a BlackBerry Storm, display the keyboard in portrait view, hold the number key for while to lock the number keyboard and then type ,5,5 to display the phone log. These debug logs are often used when your carrier needs to troubleshoot issues with your BlackBerry - so they can be quite useful. With most cell phones once you you remove the SIM card from your phone and manually clear all the phone call logs - your are set. However, with a Blackberry one can easily read your dialed and incoming phone numbers list from the debug log. During the course of normal use, this log is unnoticed. But if you ever plan to giveaway or sell your old phone, remember to clear the debug logs manually as well. Because of the value in troubleshooting issues, the BlackBerry doesn’t offer a way for you to turn off logging permanently. Your best bet is to use a reliable recycling program like that offered via Vodaphone where they use best practices to delete ALL data to avoid any privacy issues. So while Blackberry users should take an extra step - even this small security risk is no reason NOT to donate your used cell phone and see this valuable resource put to good use instead of filling a landfill.